, an ancient Greek poet, was born at Cyrene, a town in Africa, and flourished under the Ptolemies Philadelphus and Euergetes; Berenice, queen of the latter, having consecrated her locks in the temple of Venus, ad a flattering astronomer having translated them from thence into a constellation in the heavens, gave occasion to the fine elegy of this poet, which we have now only in the Latin of Catullus. He may be placed, therefore, about 280 B. C. His common name Battiades has made the grammarians usually assign one Battus for hi* father; but perhaps he may as well derive that name from king Battus, the founder of Cyrene, from whose line, as Strabo assures us, he declared himself to be descended. But whoever was his father, the poet has paid all his duties and obligations to him in a most delicate epitaph, which we find in the Anthologia; and which shews that Martial had good reason to assign him, as he has done, the crown among the Grecian writers of the epigram. He was educated under Hermocrates, the grammarian; and before he was recommended to the favour of the kings of Egypt, he taught a school at Alexandria; and had the honour of educating Apollonius, the author of the Argonautics. But Apollonius making an ungrateful return to his master for the pains he had taken with him, Callimachus was provoked to revenge himself in an invective poem, called Ibis; which, it is known? 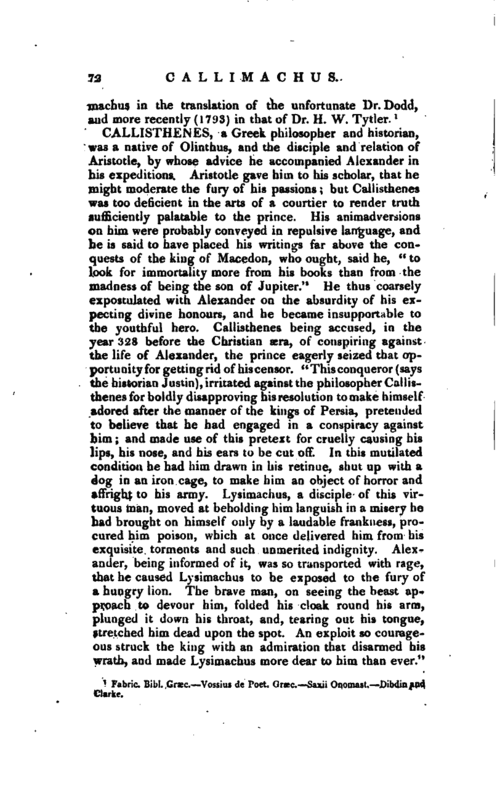 furnished Ovid with a pattern and title for a satire of the same nature. Suidas relates, that Callimachus wrote above 800 pieces; of which we have now remaining only a few hymns and epigrams, Quintilian is very justifiable in having asserted, that Callimachus was the first of all the elegiac poets. He has the credit of having first spoken the proverbial saying, “a great book is a great evil,” which critics have been fonder of repeating than authors. 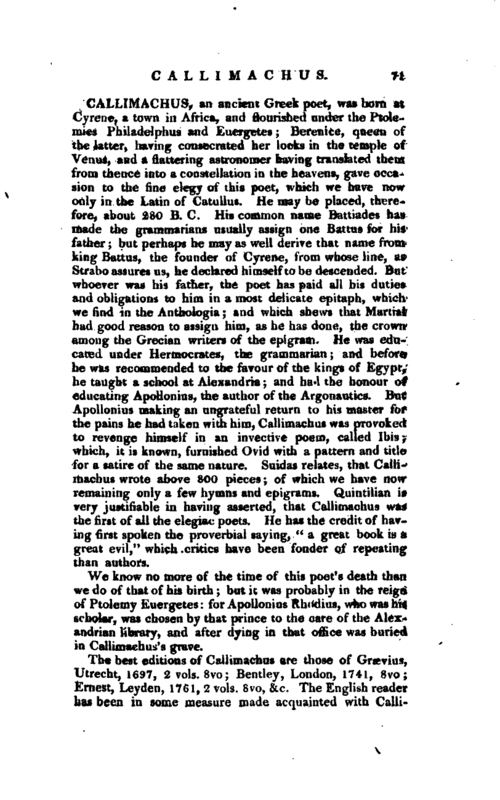 We know no more of the time of this poet’s death than we do of th,at of his birth; but it was probably in the reign of Ptolemy Euergetes: for Apollonius Rhodius, who was his scholar, was chosen by that prince to the care of the Alexandrian library, and after dying in that office was buried in Callimachus’s grave. Fabric. Bibl. Græc.—Vossius de Poet. Græc.—Saxii Onomast.—Dibdin and Clarke.